With Harley Davidson a half hour ride from our shop and both Victory and Indian just across the border in Minneapolis, it should be no surprise that Wisconsin has more motorcycles per capita than all but three states. With so many bikes out there, you may want to add some details to your ride to help it stand out. Whether you have a Sportster or a sport bike, Merton Auto Body can give your ride a custom touch with a new paint job. Merton Auto Body offers a complete motorcycle painting service using the same tools, techniques, and qualified staff that have made us a favorite for auto body work for seven decades. Want more than just a solid color? 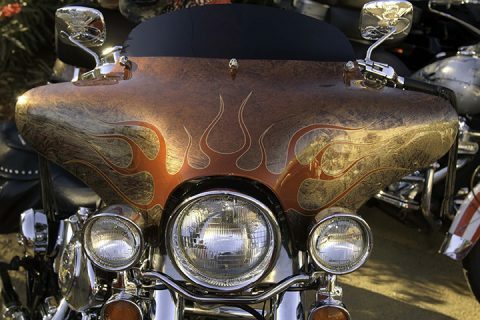 We can work with you to get the look you want, whether you’re looking to add flames, hand-painted pinstripes, or other features to your bike’s paint job. Need more than just paint? Merton Auto Body is a full service auto body shop, so we can mend the dents and scrapes in your bike’s bodywork. Note: additional charges may be necessary for tint time, tri-coat, stripes, repairs, buffing, wet sanding, etc. Motorcycle painting may not be done during peak times. We use the Spies Hecker paint system; they supply paint systems to OEM manufacturers, so you know when you have paint work done at Merton Auto Body, it will have the same quality you’d expect from a factory paint job. 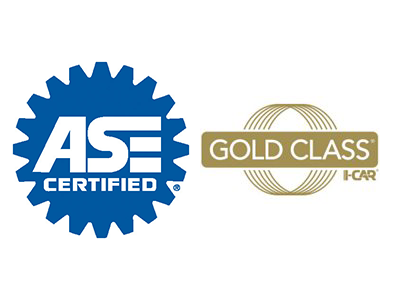 Our technicians are ASE and I-CAR certified, and we’re able to keep our work at such high quality that we back everything we do with a lifetime guarantee. We’ve worked to make our work as efficient as possible, so while it won’t take long to get your bike painted, we don’t cut corners to get your bike out the door. When you bring your bike to Merton Auto Body, you’ll know the job will be done right the first time.